Dehydroepiandrosterone (DHEA) is now widely used as an adjuvant for in vitro fertilization (IVF) cycles in poor ovarian responders (PORs). Several studies showed that DHEA supplementation could improve IVF outcomes of PORs. However, most of the PORs do not respond to DHEA clinically. Therefore, the aim of this study is to confirm the beneficial effects of DHEA on IVF outcomes of PORs and to investigate which subgroups of PORs can best benefit from DHEA supplementation. This retrospective cohort study was performed between January 2015 and December 2017. A total of 151 PORs who fulfilled the Bologna criteria and underwent IVF cycles with the gonadotropin-releasing hormone antagonist protocol were identified. The study group (n = 67) received 90 mg of DHEA daily for an average of 3 months before the IVF cycles. The control group (n = 84) underwent the IVF cycles without DHEA pretreatment. The basic and cycle characteristics and IVF outcomes between the two groups were compared using independent t-tests, Chi-Square tests and binary logistic regression. The study and control groups did not show significant differences in terms of basic characteristics. The study group demonstrated a significantly greater number of retrieved oocytes, metaphase II oocytes, fertilized oocytes, day 3 embryos and top-quality embryos at day 3 and a higher clinical pregnancy rate, ongoing pregnancy rate and live birth rate than those measures in the control group. The multivariate analysis revealed that DHEA supplementation was positively associated with clinical pregnancy rate (OR = 4.93, 95% CI 1.68–14.43, p = 0.004). Additionally, in the study group, the multivariate analysis showed that serum dehydroepiandrosterone-sulfate (DHEA-S) levels < 180 μg/dl were significantly associated with a rate of retrieved oocytes > 3 (OR = 5.92, 95% CI 1.48–23.26, p = 0.012). DHEA supplementation improves IVF outcomes of PORs. In PORs with DHEA pretreatment, women with lower DHEA-S level may have greater possibility of attaining more than 3 oocytes. Poor ovarian responders (PORs) are the women who respond suboptimally to ovarian stimulation with gonadotropins. While a variety of definitions exist for POR , the ESHRE consensus group standardized the definition of POR and established the Bologna criteria in 2011 . It is a great challenge for PORs to reach live birth in in vitro fertilization (IVF) cycles [3, 4]. No certain protocol or single intervention is accepted as an effective method to overcome the poor prognosis of PORs . Therefore, multiple strategies, including various IVF protocols , the use of adjuvant supplements [7, 8] and accumulation of vitrified oocytes or embryos  have been attempted for PORs undergoing IVF cycles. However, the optimal management for PORs remains an unsolved problem. Regarding adjuvant supplements, dehydroepiandrosterone (DHEA) is currently widely used worldwide and is considered a potential agent to ameliorate the IVF outcomes of PORs. DHEA is an endogenous steroid generated by the adrenal glands and ovarian theca cells, and acts as a precursor for testosterone , which was reported to be engaged in early follicular development . DHEA was first used in PORs in 2000 by Casson et al. who demonstrated that DHEA treatment could enhance response to ovarian stimulation . Later, several studies showed the beneficial effects of DHEA on ovarian reserve , oocytes and embryo quality [14, 15] and pregnancy outcomes [16, 17] in PORs. Recent meta-analyses also revealed that DHEA supplementation could improve ongoing pregnancy or live birth in PORs undergoing IVF cycles [18, 19]. However, there is a lack of large-scale, well-designed randomized controlled trials to verify the beneficial effects of DHEA in PORs. In clinical practice, some PORs saw improvement in IVF outcomes after DHEA supplementation; however, others failed to respond to DHEA treatment. It is believed that there are certain subgroups of PORs who could benefit more from DHEA supplementation than others. Therefore, the aim of this study is to confirm the beneficial effects of DHEA on IVF outcomes and to identify the subgroups of PORs that may benefit more from DHEA supplementation. This is a retrospective cohort study. Patients were treated at the Reproductive Center of the Kaohsiung Veterans General Hospital between January 2015 and December 2017. The study conformed with the “Declaration of Helsinki for Medical Research involving Human Subjects.” Additionally, approval was obtained from the institutional review board at Kaohsiung Veterans General Hospital, with the identifier VGHKS18-CT6–09. The study was performed in accordance with approved guidelines. A total of 1658 IVF cycles were performed during the study period. Among these cycles, women who met the Bologna criteria were defined as PORs. Bologna criteria  included at least two of the three following features: (1) advanced maternal age (≥ 40 years) or any other risk factor for POR, (2) a previous poor ovarian response (≤ 3 oocytes with a conventional stimulation protocol), and (3) an abnormal ovarian reserve test. An abnormal ovarian reserve test was defined as antral follicle count (AFC) < 5 or anti-Müllerian hormone (AMH) < 1 ng/mL in this study. Additionally, two episodes of a previous POR after maximal stimulation alone would be sufficient to define a patient as a POR. The exclusion criteria were as follows: (1) patients who did not undergo gonadotropin-releasing hormone (GnRH) antagonist protocol, (2) patients who underwent fresh embryo transfer, (3) patients who underwent oophorectomy, and (4) patients who took herbal drugs or other supplementation (e.g., growth hormone). PORs identified in this study were then divided into POR and POR/DHEA groups. In the POR group, patients directly underwent an IVF cycle without DHEA pretreatment. In the POR/DHEA group, patients received daily DHEA supplementation (CPH; Formulation Technology, Oakdale, CA, USA) of 90 mg for an average of 3 months before entry into an IVF cycle. DHEA supplementation or not was decided based on patients’ consideration and preference after full consultation provided by a doctor. The study flow chart is shown in Fig. 1. The efficacy of IVF protocols, especially between GnRH agonist and antagonist regimens, is still controversial [20, 21]. However, the GnRH antagonist protocol was the most popular one for PORs in a worldwide survey . Therefore, a GnRH antagonist protocol was routinely used for PORs in our reproductive center. Controlled ovarian stimulation was conducted within 5 days of the menstrual cycle, with 300 IU of recombinant FSH (Gonal-F, Merck KGaA, Darmstadt, Germany) or recombinant FSH + LH (Pergovaris, Merck Serono, Aubonne, Switzerland or Merional, Institut Biochimique SA, Lamone, Switzerland). Daily injections of a GnRH antagonist (Cetrotide 0.25 mg, Merck Serono, Idron, France) were given from the day the leading follicle reached 12–14 mm in diameter until the day of oocyte trigger. Dual trigger, combined recombinant hCG (Ovidrel 250 μg, Merck Serono, Modugno, Italy) and GnRH agonist (Lupro 2 mg, Nang Kuang Pharmaceutical Co, Ltd., Tainan, Taiwan), were administered when at least one dominant follicle reached a mean diameter of 17 mm. Oocytes were retrieved 34–36 h after oocyte trigger under the guidance of transvaginal ultrasound. Intracytoplasmic sperm injection (ICSI) was performed in all patients to diminish the potential of fertilization failure. Embryos were evaluated and graded according to the criteria established by the Istanbul consensus workshop . All embryos were cryopreserved by vitrification on the third day after oocyte retrieval for subsequent frozen embryo transfer (FET) cycles. An artificial cycle was used for endometrial preparation of FET, as previously described . Embryo transfer was done under transabdominal sonographic guidance. Regarding luteal phase support, daily progesterone, including Crinone 8% gel (Merck Serono, Hertfordshire, UK) and Duphaston 40 mg (Abbott, Olst, the Netherlands) were given. A pregnancy test was carried out 15 days after embryo transfer. Once a positive pregnancy test was observed, progesterone was continued until 8–10 weeks of gestation. The primary outcome measures were the number of retrieved oocytes and clinical pregnancy rate. Clinical pregnancy was confirmed if a visible fetal heart beat was found in an intrauterine gestational sac by transvaginal ultrasound. The secondary outcome measures included number of mature oocytes, fertilized oocytes, day 3 embryos, top-quality day 3 embryos, ongoing pregnancy rate and live birth rate. Ongoing pregnancy was defined as the presence of a fetal heart beat beyond 20 weeks of gestation. Live birth was determined by delivery of a live fetus after 20 completed weeks of gestation. Cycle cancellation was defined as incomplete cycles due to no response to gonadotropins or no retrieved oocyte. Normality of quantitative variables was revealed by Kolmogorov-Smirnov test. Independent t-tests were used to compare quantitative variables. The categorical variables were compared using Chi-Square tests. In addition, binary logistic regression was used to assess odds ratios (ORs) and 95% confidence intervals (CIs) of clinical pregnancy and the number of retrieved oocytes > 3 after adjusting for confounders. All analyses were performed using the Statistical Package for Social Sciences (SPSS) version 20.0 (Chicago, IL, USA). Comparisons with a p-value less than 0.05 were considered significant. A total of 176 cycles met the Bologna criteria (10.6%). Among these cycles, there were 4 cycles that did not receive GnRH antagonist protocol, 3 cycles that received fresh embryo transfer, 2 cycles that underwent oophorectomy, and 16 cycles that received herbal drugs or growth hormone and were excluded from the study. Ultimately, 151 cycles were identified in this study and divided into the POR group (n = 84) and the POR/DHEA group (n = 67). There were no differences between the two groups regarding age, body mass index, infertility duration, previous IVF attempts, primary or secondary infertility, basal follicle stimulation hormone (FSH), dehydroepiandrosterone-sulfate (DHEA-S) concentration, AFC, AMH and Bologna criteria category (Table 1). The cycle characteristics and IVF outcomes between the two groups are presented in Table 2. There were no significant differences in terms of stimulation duration or gonadotropin dose. The POR/DHEA group had a greater number of retrieved oocytes (3.3 ± 2.5 vs. 2.0 ± 1.5, p < 0.001), metaphase II oocytes (1.9 ± 1.5 vs. 1.0 ± 1.1, p < 0.001), fertilized oocytes (2.3 ± 1.7 vs. 1.4 ± 1.2, p < 0.001), day 3 embryos (2.1 ± 1.6 vs. 1.3 ± 1.2, p = 0.001) and top-quality embryos at day 3 (1.0 ± 1.1 vs. 0.4 ± 0.8, p = 0.001) than did the POR group. Furthermore, the rate of retrieved oocytes > 3 (34.3% vs. 14.3%, p = 0.004), the clinical pregnancy rate (23.9% vs. 7.1%, p = 0.004), ongoing pregnancy rate (17.9% vs. 6.0%, p = 0.021) and live birth rate (16.4% vs. 6.0%, p = 0.038) were significantly higher in the POR/DHEA group than in the POR group. Cycle cancellation rate was similar between the two groups. As shown in Table 3, the multivariate analysis revealed that DHEA supplementation was significantly associated with clinical pregnancy rate (OR = 4.93, 95% CI 1.68–14.53, p = 0.004). In addition, in the POR/DHEA group, multivariate analysis (Table 4) showed POR with serum concentration of DHEA-S less than 180 μg/dl was significantly associated with the possibility to retrieve more than 3 oocytes (OR = 5.92, 95% CI 1.48–23.26, p = 0.012). In this retrospective cohort study, the incidence rate of POR based on Bologna criteria was 10.6% (176/1658) and was compatible with that of previous study . Additionally, the poor prognosis of Bologna PORs undergoing IVF/ICSI cycles without DHEA supplementation in this study was also consistent with previous study . However, after DHEA pretreatment, the present study demonstrated that number of retrieved oocytes, metaphase II oocytes, fertilized oocytes, day 3 embryos, top-quality embryos at day 3 as well as clinical pregnancy rate, ongoing pregnancy rate and live birth rate significantly improved. Furthermore, the multivariate analysis displayed that PORs with DHEA supplementation exhibited a 4.93-fold increase in the clinical pregnancy rate (95% CI 1.68–14.53, p = 0.004) compared to those without DHEA supplementation (Table 3). Numerous studies [15, 17, 26–28] and some meta-analyses [18, 19, 29] also support the beneficial effects of DHEA on PORs undergoing IVF/ICSI cycles. The systematic review and meta-analysis conducted by Zhang et al. showed that DHEA supplementation increased the clinical pregnancy rate, live birth rate and ovarian reserve in patients with poor ovarian response . However, few randomized controlled trials with limited cases were analyzed, and the inclusive criteria for PORs were heterogeneous. Moreover, the Cochrane Review included only randomized controlled trials and concluded that pretreatment with DHEA may be associated with improved live birth rate in patients undergoing IVF/ICSI cycles . Nevertheless, the Cochrane Review also included the studies of pretreatment with testosterone and the patients who were not identified as PORs. 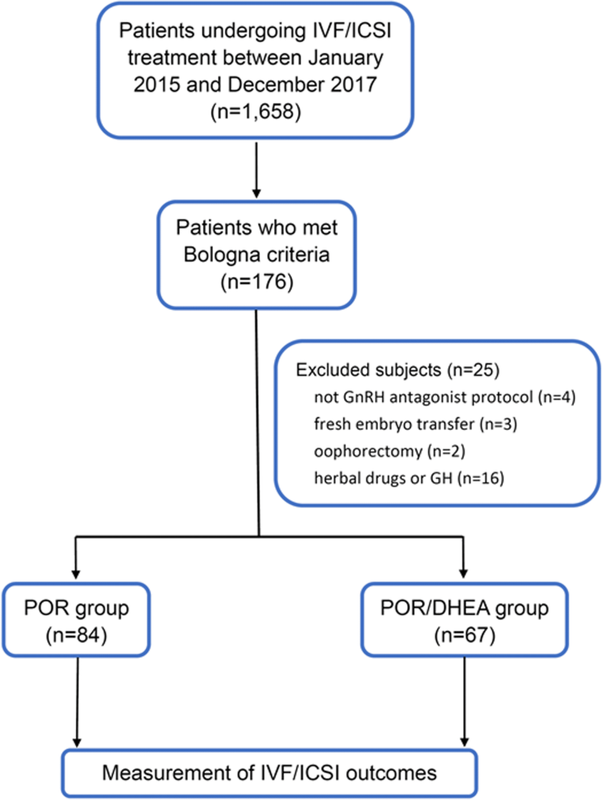 An updated randomized controlled trial performed by Kotb and colleagues, enrolled PORs according to the Bologna criteria and revealed that DHEA supplementation significantly increased the number of oocytes, fertilization rate, fertilized oocytes, clinical pregnancy rate and ongoing pregnancy rate . Similarly, the small sample size was also a limitation of the study. Therefore, taken together, based on current evidence and our retrospective cohort study, DHEA supplementation seems to improve IVF/ICSI outcomes and ovarian reserve in PORs. However, additional large-scale, well-designed randomized controlled trials are necessary to confirm the beneficial role of DHEA in PORs. Furthermore, although we used a GnRH antagonist protocol in this study, we believed that other protocols, especially a non-suppressive stimulation protocol, like microcode agonist protocol could also reach better results after DHEA supplementation. However, further studies are needed to prove this concept. The major mechanism of DHEA on the improvement of reproductive outcomes is associated with increased androgen after DHEA supplementation. DHEA, a precursor of estradiol and testosterone, serves as a prohormone of follicular fluid testosterone during ovarian induction . Androgen receptors (ARs) have been identified in the granulosa cells (GCs) at any follicular stage, especially preantral and antral follicles [31, 32]. In GC-specific AR knockout mice, mice were subfertile with longer estrous cycles, fewer ovulated oocytes, reduced follicle progression and increased follicle atresia [33, 34]. GC-specific ARs seemed to be pivotal regulators of follicular development and fertility. Indeed, androgen has been reported to play roles in recruitment and initiation of primordial follicles [35, 36], promotion of follicular growth by increasing FSH receptor expression [37, 38], and prevention of follicular atresia by reducing apoptosis . Moreover, DHEA administration increases serum concentration of insulin-like growth factor-1 (IGF-1) , which has been reported to be correlated with oocyte quality and embryo development [40, 41]. Therefore, indirect action of DHEA was mainly presented. However, direct action of DHEA on the target organs has been proposed [42, 43] but is still inconclusive. Regarding the molecular mechanism, our previous studies revealed that DHEA supplementation could improve mitochondrial function and reduce apoptosis in the cumulus cells  and human granulosa cell line . Returning to clinical practice, however, not all PORs benefit from the DHEA pretreatment. Thus, we attempted to investigate which subgroups of PORs with DHEA supplementation benefit most from such pretreatment. The current study found that PORs with lower DHEA-S concentration (< 180 μg/dl) exhibited a 5.92-fold increase in the rate of retrieved oocytes > 3 (95% CI 1.48–23.26, p = 0.012) compared to those with higher DHEA-S concentration (≥ 180 μg/dl) (Table 4). Hypoandrogenism has been reported to be in association with diminished ovarian reserve . Low androgen levels can be of ovarian and/or adrenal etiology. Since DHEA-S is almost exclusively produced by adrenals, it is generally accepted that low DHEA-S reflects an adrenal cause for low androgen levels. Therefore, our finding would suggest that DHEA supplementation was especially effective if androgen deficiency was of adrenal origin. Gleicher et al. demonstrated that patients with secondary ovarian insufficiency induced by adrenal hypoandrogenism dramatically improved in ovarian function after DHEA supplementation . Another study conducted by Gleicher and colleagues showed that in women with high-AMH/low-testosterone phenotype associated with adrenal insufficiency, DHEA supplementation equalizes low to normal testosterone and normalizes IVF cycle outcomes . Taken together, patients with low DHEA-S levels, implying adrenal hypoandrogenism, could obtain greater improvement from DHEA supplementation. In addition, in developed countries, most cases of primary adrenal insufficiency are caused by autoimmunity, frequently coexisting with other autoimmune abnormalities . Therefore, further survey for autoimmunity in these patients may be needed. The strength of this study lies in its strict exclusion criteria and subgroup analysis. However, there were some limitations in this study. First, this is a retrospective study with relatively small sample size. Second, the patients identified based on the Bologna criteria may be heterogeneous. Moreover, serum DHEA-S levels were checked not at the time when patients were included in the study, but within 6 months before DHEA supplementation or IVF cycles. We believed that the serum DHEA-S levels of this study were representative. However, potential bias could not be excluded. In conclusion, the IVF outcomes of PORs could potentially benefit from pretreatment with DHEA. In PORs who received DHEA supplementation, women with lower DHEA-S levels could achieve higher possibility of retrieving more than 3 oocytes. This work was generously supported by grants VGHKS18-CT6-09 from Kaohsiung Veterans General Hospital. CUC and LTL are responsible for drafting the article. PHW, ZHW and AC are responsible for design of the study. SGV, SNC and HWT are responsible for analysis and interpretation of data. KHT and LTL are responsible for supervising the research and revising the manuscript. All authors read and approved the final manuscript. The study conformed to the “Declaration of Helsinki for Medical Research involving Human Subjects”. Additionally, approval was obtained from the institutional review board at Kaohsiung Veterans General Hospital, with the identifier VGHKS18-CT6–09. The study was performed in accordance with approved guidelines.